What is a High Sheriff? How are High Sheriffs Appointed? 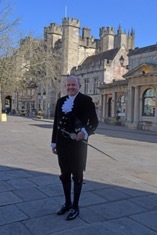 On a glorious sunny Sunday on 24thMarch 2019 at the Legal Service held at Wells Cathedral, the reins of this historical post were past from outgoing High Sheriff Denis Burn to Johnnie Halliday. This follows Johnnie`s declaration as the Sovereigns Legal representative in the county for law and order. “Pathways to Apprenticeships aims to encourage young pupils who receive less support at home than their peers, to start the journey to find routes into fulfilling employment. Working with schools, colleges and parents or guardians, the goal is to improve the self-esteem of this challenged pupil age group by encouraging them into finding rewarding futures. The unlocking potential programme is based around public speaking, outbound days and interaction with apprentices and business to help motivate them and raise aspirations;” he added. Johnnie was brought up in Somerset and continues to live in his family home near Taunton. Most of his business career has been spent in various commercial and executive roles in the asset finance, lending and software related industry in London and internationally. Since basing himself full time in Somerset, Johnnie has established Asset Finance Management Solutions an independent strategy and operational consultancy for finance providers and investors. In 2017 he was Chair of industry networking and charitable trust, The Asset Finance Professionals Association, which raises money for smaller charities. He continues to serve as a trustee and is delighted that AFPA is supporting the Pathwaysto Apprenticeships initiative during his year in office. At home he is involved in the family farming and property business. Johnnie is an active supporter and Trustee of Somerset Crimebeat, the High Sheriffs Charity focusing on preventing youth crime. Johnnie is married to Sian and they have two recently married sons Will and Tom. He enjoys nothing more than family, social and sporting occasions whether walking dogs, playing tennis or golf, watching rugby in Bath or cricket at the County Ground in Taunton.